It has been 42 days since I’ve posted anything to my blog. My guilt propels me to provide an explanation for my absence. In short, I have no excuse at all. I have just not been inspired. That could be because life—that is, LIFE in capital letters—has pulled my creative energy elsewhere. You ask, What in life could stifle one’s passion for the written word? Let me begin with illness. Over the past 5 weeks every person in my family has suffered from one illness or another. Some have been chronic like especially bad seasonal allergies, and some acute like the common cold or Flu B that made it seem as if someone stole the batteries from my Energizer Bunny son. Then there’s been the random virus. You know the one. That one when you take your daughter to the pediatrician, all she can say is, “Yep. She’s sick.” No cure, no medicine, just a she’s-sick, and thanks for that $20 co-pay, the one you had to pay just in case your daughter had strep throat, which, as we now know, she doesn’t because she’s just sick. I knew she was sick before I paid my $20. That one. Family has also led to my writing timeout. My father, my brother, his fiancé and his three kids visited Houston last week. I played hostess, chef, and tour guide. We went to the famed Houston Livestock and Rodeo, saw Kenny Chesney perform, went to an amusement park, toured some caverns, and slept in teepees. Fun, good times, great memories, but I was not home long enough to type a sentence. Preparing for the family visit took up a great deal of time. I looked at my kitchen table and said, “Kitchen Table, you need a makeover.” So, I poured my creative spirit into refinishing the kitchen table, which led to refinishing the chairs, the dining room table, two bedside tables, and two end tables. I was a sanding and staining machine! There was something so soothing about sanding tabletops. This led to other projects like painting the front door, painting all the doors to the rooms upstairs, scrubbing carpet stains, washing curtains, and touching up the walls and kitchen island. As with most things I do, I became slightly addicted to this work. I can say I enjoyed each book, and it was a good use of my sabbatical from writing. 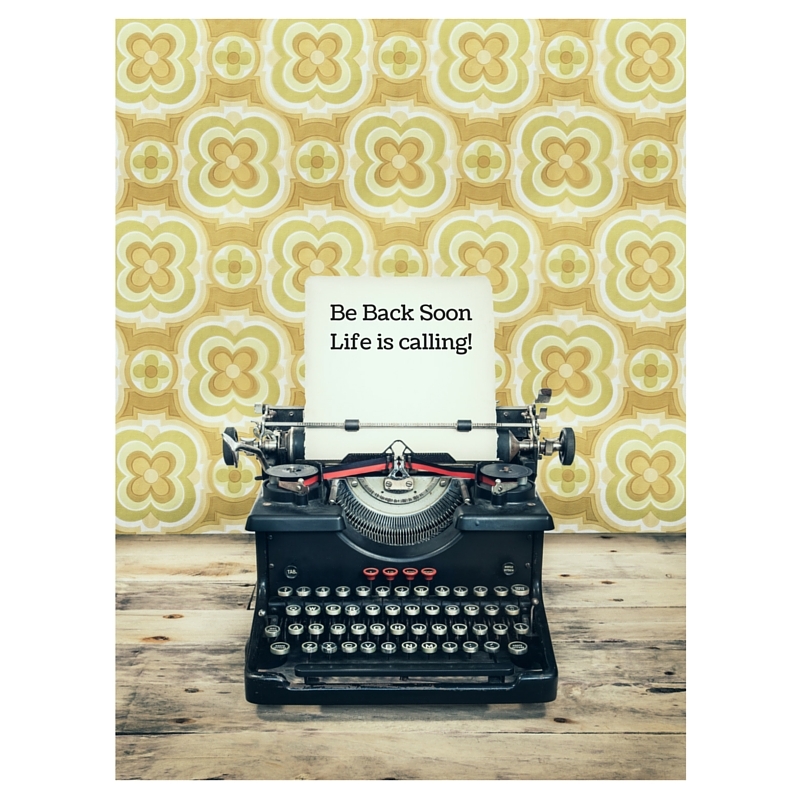 I feel as if whatever muse I have has also returned from vacation so for better or worse my creative musings will flow once again. Bullying is Serious: What’s a Parent to Do? Remember the scene in Back to the Future when Marty McFly dodges mean ol’ Biff and his gang? On a homemade skateboard, Marty turns at the last second, and Biff runs his convertible into a truck full of manure. Who didn’t cheer for Marty? In the movies, bullies often get what’s coming to them amidst a cheering crowd. One of my favorite middle school movies was My Bodyguard, a story about a middle school boy being bullied who stood up for himself and befriended a slightly odd fellow who happened to be twice as big as the bullies. In that movie, the bullies got what was coming to them, and we all got a good laugh out of it. In real life, bullying is more serious. The standard definition of bullying is behavior that involves unwanted, intentional, aggressive physical or verbal behavior that involves a real or perceived imbalance of power and is repeated over time (Olweus, 1993). The American Educational Research Association (2013) opens a comprehensive report on bullying with the following quotation: “Bullying presents one of the greatest health risks to children, youth, and young adults in U.S. Society” (p. 1). This indeed is serious and apparently widespread. According to the National Association of School Psychologists, an estimated 160,000 children miss school every day due to fear of another student (Fried & Fried, 2003). Ninety (90%) percent of 4th through 8th graders report being bullied. Seventy-five (75%) percent of school shootings that have occurred over the past decade have been linked to harassment and bullying. Researchers at Yale School of Medicine analyzed studies from 13 countries and found signs of an obvious connection between bullying, being bullied, and suicide. (Kim & Levental, 2008). For most of these beaten-down kids, there is no bodyguard to save them. There are no cheers in the theaters or cafeterias. Some children endure bullying their entire educational lifespan. I cannot think of one thing worse than being bullied…except, learning that your own child is being bullied. Over the holiday break, my daughter let it slip that a girl in her class keeps taunting her and embarrassing her in front of her friends. I know this child fairly well as my daughter and she ran around in the same circle for a while. She is a very pretty girl, who is always surrounded by a group of girlfriends, and her personality can be little intimidating. She meets the typical criteria of a bully. My daughter is shy and somewhat insecure. She doesn’t ever want to make waves socially. I am guessing my daughter is an easy target also because she has been in special education classes and struggles to read. Are those your real nails, or are you wearing fake nails? What is up with your hair today? Did you just come out of the river? I can’t believe you got such a low grade on the test. Each question/statement is made with smirk and followed by a belittling laugh. The other day she asked my daughter why she was wearing a bandage on her arm. When my daughter explained she had scrapped it when she fell out of a tree, this girl just fell on the ground laughing. I say, “Just ignore her.” I can’t. “Why?” It hurts, and it won’t matter. She’ll say stuff anyway. I say, “Answer her questions with a question of your own, you know, push back a bit.” I could never do that. She’s surrounded by her friends. I ask, “What do your teachers say or do?” Nothing. She’s real sneaky. She knows just when to say something when the teacher isn’t around. I ask, “Do you want me to talk to her mom?” No, that will just make her mad, and it will be worse. I want to tell my daughter this will pass, but if they go to the same high school, it may not pass. This behavior could escalate and become more violent or psychologically torturous. This bully could take her campaign to the World Wide Web or a viral text. She could post something nasty about my daughter on Facebook for the whole world to “Like”. I am relatively sure my daughter has the resilience to handle this abuse, but one never knows. I remember back in 2010 being stunned by a suicide in a small town named Hadley in Massachusetts. It was right next to Amherst where I lived for four years. Phoebe Prince, a young girl who had recently moved to Hadley from Ireland hung herself after three months of relentless bullying. She briefly dated a boy, which angered some of the other students. The bullying that ensued was horrendous. She was verbally harassed at school, physically assaulted, and victimized over the Internet. At the time, I was sickened by this event. It was so difficult for me to wrap my mind around how cruel people could be to another human being. Phoebe must have been in a hopeless state of mind to see suicide as her only way out. I wanted to shake this girl and say, “Hey, it’s only high school. It’s a small blip on the timeline of your life.” Yet, for the victim it must have felt like a life sentence with no parole. Lesson learned: Some people are not resilient enough to handle bullying. So now I wonder and worry. I have no idea how to help my daughter deal with a bully. Obviously, if it escalates I will involve the child’s parents and the school, but for now I just listen with a sympathetic heart and pray this situation will resolve itself soon. AERA (2013). Prevention of Bullying: Research Report and Recommendations. AERA Issues Report on Prevention of Bullying in Schools and Colleges. Washington, D.C.
Fried, S., & Fried, P. (2003). Bullies, targets and witnesses. New York: Evans. Olweus, D. (1993). Bullying at school. Oxford, UK: Blackwell. Kim, Y.S. & Leventhal, B. (2008). Bullying and Suicide: A Review. Int J Adolesc Med Health. Apr-Jun;20(2):133-54. I am new to the Jenny Lawson camp, but I definitely want to sign up to be a card-carrying member of her fan club. This newfound love for this humorist and blogger (see Bloggess) came after listening to her read her newest book Furiously Happy. Most critics describe this second book as a collection of essays about her mental disorders toldthrough sardonic, witty humor. Lawson writes about early on-set social phobia and how that manifests today in hiding in her own house whenever someone rings her doorbell. She is completely aware that how she reacts to certain situations is irrational, and goes so far as to call herself crazy. In fact, Lawson relates a lengthy conversation she has with her mother over whether or not she is crazy. Jenny, I believe, wins that one. Yet, Lawson is okay with being crazy. In fact, she embraces the notion, and punctuates her book with reasons why people who have mental disorders like she has should not sit alone in shame, but celebrate their differences. She calls for society to re-envision how we think about and relate to people with mental disorders. That’s where the name of her book has its origins. She refuses to continue life down in the dumps. 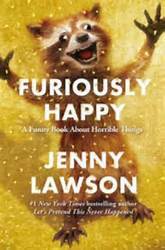 Instead, she wants to be “furiously happy.” According to Lawson, we all have a choice—even in the midst of terrible events—to be happy. The furious part of the equation is how hard one should work to be happy. So, yes, this book is about mental illness, but to me it was more than that. What captured my attention were her long, convoluted, stream-of-conscience ramblings about how she copes with and lives an ordinary life as a mother, wife, daughter, and friend. These stories are cross-your-legs funny. In fact, a woman in my book club suggested the publisher should sell Poise pads with each copy. I thought that was a great idea. As the daughter of a taxidermist, she loves playing with her taxidermied raccoon named Rory and sometimes she involves her cats in these games. She write a lengthy chapter about dressing up as a Koala bear when she meets Koala bears in Australia, a place she swears wants to kill her. • In one chapter, Lawson writes about how she fell asleep in a strange position and both arms went numb. When she awakens, she falls out of bed and lies there pondering her temporary paralysis. Then, she asks her husband to set up her recorder so she can work with no hands (or hands experiencing the pins and needles of recovery) while lying on her bedroom floor surrounded by her cats. That’s a dedicated writer! • In her chapter on parenting, Lawson begins with, “I don’t know how many times I’ve done meth in front of my child.” Of course, she is kidding, but it is her way of saying that once you make that statement, anything else you do as a parent seems fabulous. Statements like the one above are often dotted generously with swear words, that quite frankly I think add to the effect of her writing. When I listened to Lawson read her own stories, I felt as if I were listening to the crazy twin inside my own head. I got her sense of humor because I think a lot like her. I am not sure Lawson would find that complimentary, but I do. I often write potential skits for Saturday Night Live in my head. I too am a bit crazy as I also suffer from clinical depression, anxiety and compulsiveness. Although I am not social phobic, the older I get the more I too want to pretend I am not home when the doorbell rings. So, I highly recommend this book to (1) those who are crazy like Lawson and me, (2) those who are not necessarily crazy but love crazy people, and (3) people who make not love crazy people but have always been curious about the way they think.